Vila Madalena is a popular neighborhood in São Paulo, full of restaurants, bars, shops, galleries and colorful street art. In the 1970s, São Paulo students flocked to the area in search of cheap accommodation, giving it a bohemian character. While Vila Madalena is now considered a bairro nobre (upper middle class neighborhood), it still retains a lot of its creative charm and is a wonderful place to spend a day and evening exploring, appreciating art or satisfying hunger or thirst at one of the many trendy bars and restaurants in the area. The neighborhood is a favorite of tourists and was especially popular while Brazil was hosting the World Cup. My first couple of visits to Vila Madalena were to watch games during the World Cup. The first time was for the game between Brazil and Cameroon. The streets were as people-packed as New Orleans’ French Quarter during Mardi Gras and it was difficult to find a place to watch the game that wasn’t charging an exorbitant cover charge. All the while, it was a very festive and fun atmosphere. I came back to Vila Madalena again to watch the final game of the World Cup between Germany and Argentina. 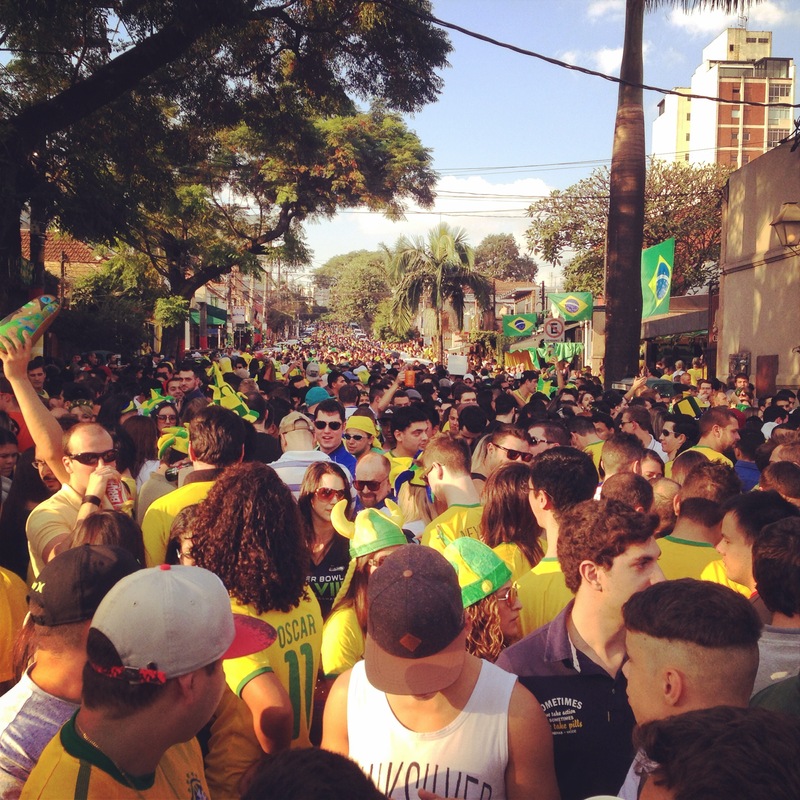 This time the streets weren’t nearly as crowded (Brazilian fans were still in shock from the 7-1 defeat by Germany). The military police were out in full force, but it seemed that the mayhem they were expecting never actually materialized there. My friends and I were able to watch the game in a restaurant/bar called Seu Domingos (Rua Fidalga 209). It was a nice place to share bottles of Original and snack on fried food while watching the game. I took another trip to Vila Madalena because I wanted to have a wander through its famous graffiti alleys and get an idea of what the neighborhood is like when it is not filled with football fans. I took the Metro (Linha Verde) all the way to the western terminus at the Vila Madalena station. Walking down to the heart of the neighborhood from the Metro station can be challenging if you’re not used to climbing up or down steep inclines. The neighborhood is not the easiest for walking, but excellent if you happen to have missed a day at the gym! 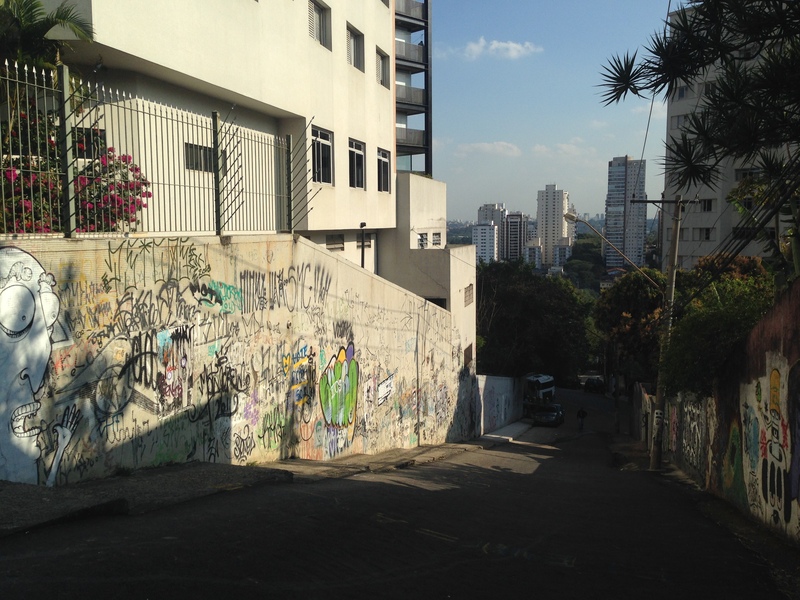 Between the streets, there are some passages filled with street art and fantastic views of the city from atop the hills. To explore Vila Madalena, I followed the path of a self-guided walking tour presented in the Louis Vuitton São Paulo City Guide. The path was interesting, but a lot of the galleries and shops identified in the guide no longer exist. 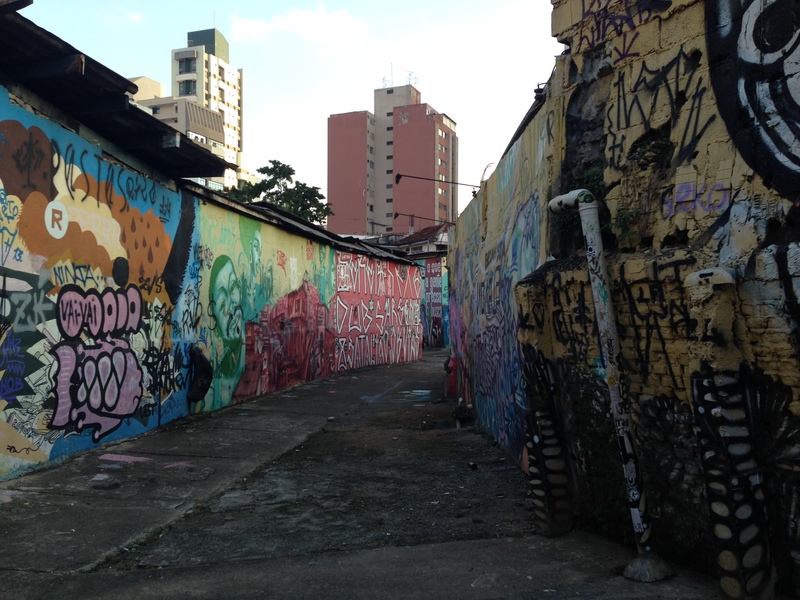 The guide started at one of the most famous points of interest in Vila Madalena, the Beco do Batman, a network of alleyways that have become a graffiti art gallery. The Beco is located at the intersection of Ruas Gonçalo Afonso and Medeiros de Albuquerque. It traces its history back to the 1980s when art students would practice their designs on the walls of the alley. Today, the designs are maintained by the community and allowed to change every so often. The place is definitely a must-see stop for tourists visiting Vila Madalena. Next, I walked along the Rua Luis Murat beside the Cemitário de São Paulo to the Beco do Aprendiz, located on Rua Belmiro Braga, another network of alleys with amazing street-art. Formerly a haven for drug traffickers, the area was taken over by the local community and dedicated to the appreciation of visual arts. The Louis Vuitton guide then took me through various points along Rua Fidalga, Rua Aspicuelta, Rua Harmonia and Rua Girassol. These streets are lined with innovative shops and art galleries and trendy restaurants and bars. Vila Madalena is definitely a great place to browse by day and imbibe by night. Mercearia São Pedro, Rua Rodésia 34. This boteco has a rotating menu of feijoada, contra file and every day offerings like picanha that come with an all-you-can-eat buffet of salads, vegetables, rice, potatoes and more. All of this can be had for less than R$30. It is a great place for lunch, especially if you’re super hungry. Apparently, it turns into more of a bar atmosphere at night. Coffee Lab, Rua Fradique Coutinho 1340. This café offers a dizzying array of possibilities for your cup of joe, all with an über-cute laboratory theme. The café also functions as a school for baristas, run by a passionate coffee connoisseur. Simply put, they serve delicious coffee. Vapor Burger & Beer, Rua Fradique Coutinho, 1464. Definitely a candidate for one of the best-burgers in São Paulo. They use a special technique (actually developed in Connecticut in the 1920s) where they remove the fat from the meat while preserving the flavor. The most popular burgers are the #Hashtag Bacon, Cheddar and Austrialiano. I had the Cheddar and thought it was absolutely delicious. 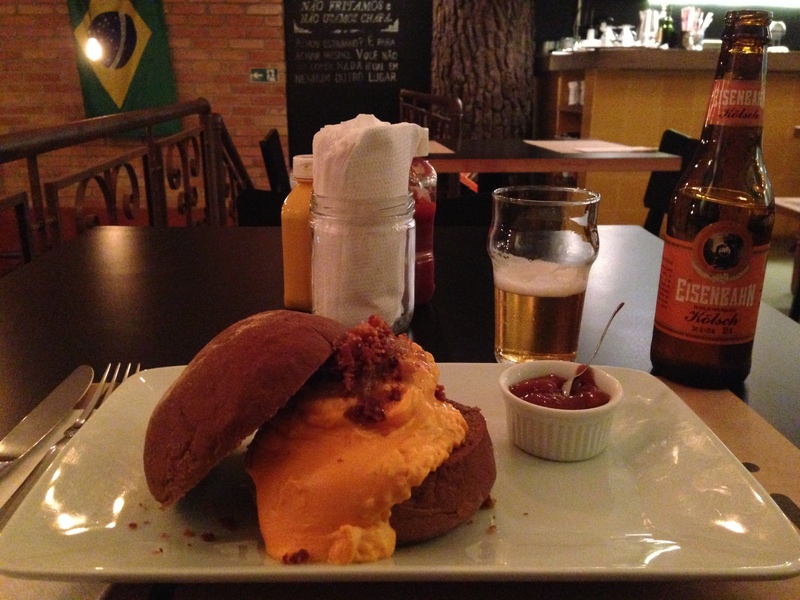 Try one along with a bottle of Eisenbahn beer from Blumenau. Heading back to the Vila Madalena Metro station from the main streets of the neighborhood is quite a hike up some very steep hills. I opted for a cab and it only cost about R$10. I found the neighborhood to be really charming and fun to explore. 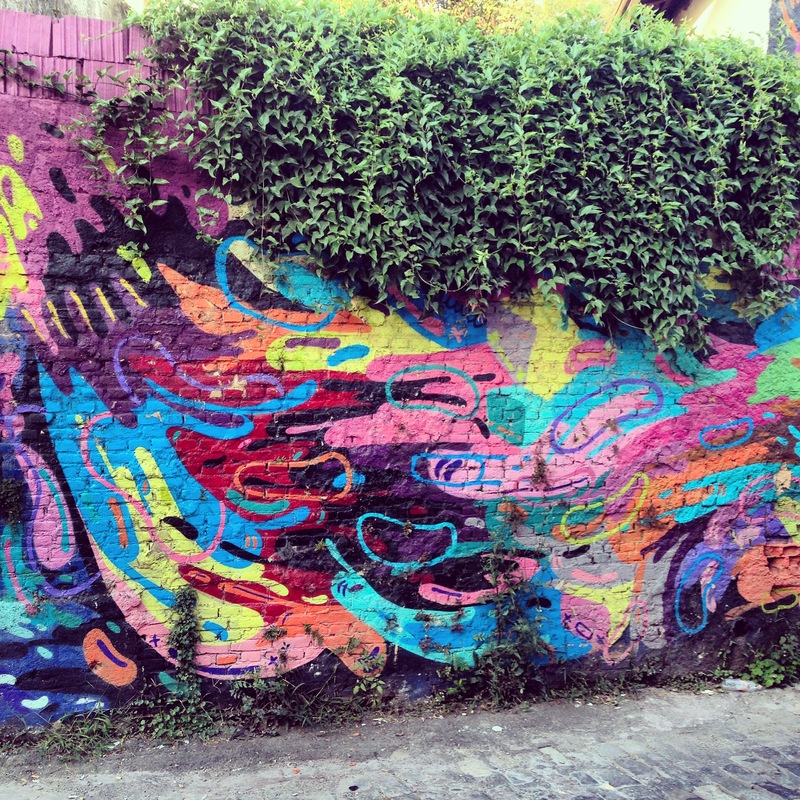 Without a doubt, visitors to São Paulo should try to spend a day or night in this trendy and creative neighborhood. 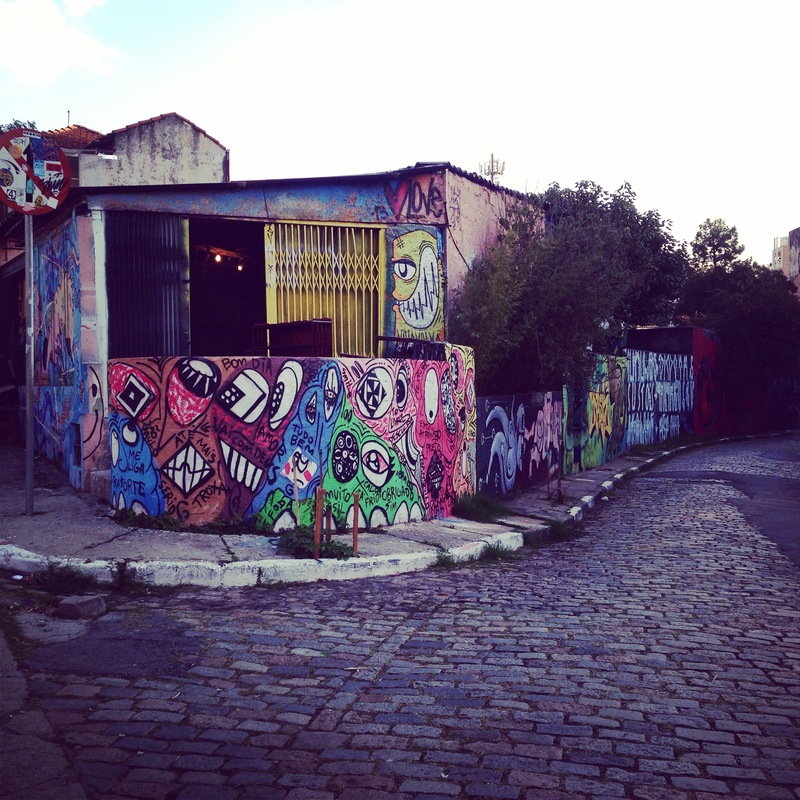 Have you visited São Paulo’s Vila Madalena? What places would you recommend people visit?